The fifth book of the garage sale series does not disappoint. Sarah Winston unable to sleep is working on school swap and secret auction.The lights go out and found herself locked in the storage room. Sarah hears strange noises in the room and loses her cool and conscious. The next morning after she was recused she finds the body of the school superintendent at the garage sale. Sarah begins to look into the death and the stolen items from the swap. This will take her on several paths as she starts to unravel the affairs of the school board members. Will Sarah be successful without putting her life on the line? Garage sale tips are included. I highly recommend this book and series. Disclosure: Many thanks to Kensington, Books for my copy for review. The opinions expressed are my own. 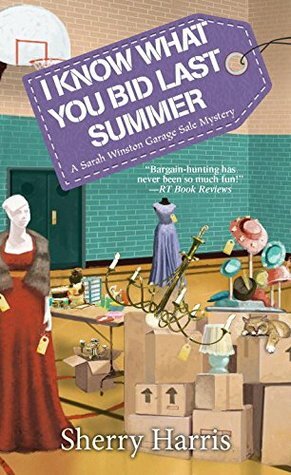 This entry was posted in #NetGalley, Books, Uncategorized and tagged cozy mystery, Favorite, garage, Sarah, scool, Sherry Harris. Bookmark the permalink. I have to read this series. You will like it. Start from the first one.